to go back to the main pages. 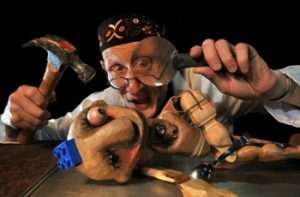 In 2016 I was asked by the Upfront Puppet Theatre near Penrith to produce a sound track for Pinocchio. These are the un-edited tracks. Short sections were edited into the soundtrack to suit the action on stage, so there is much repetition. 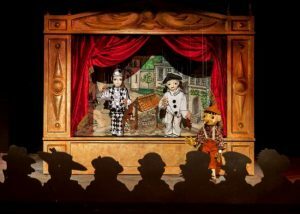 I aimed to capture a Gypsy/Bohemian/Cafe feel, using a range of instruments playing variations on traditional tunes, so that each puppet character could be identified with a particular instrument. Ali Lloyd plays accordion. Bill Lloyd plays banjo, whistles, pipes, and tenor guitar. Other instruments are edited recordings of session musicians, assembled to fit the different styles.